Political prisoner Oleh Sentsov's lawyer Dmitry Dinze and his cousin Natalia Kaplan have been invited to the European Parliament to receive the Sakharov Freedom of Thought Prize awarded to him. "Lawyer of Ukrainian film director, political prisoner Oleh Sentsov, Dmitry Dinze, and his sister Natalia Kaplan were invited to the European Parliament to receive the Sakharov Freedom of Thought Prize awarded to the Ukrainian director," Sentsov's cousin said on the air of Hromadske TV channel on Thursday. "It is planned so far that two of us will go," said Kaplan. Kaplan noted that a money reward of EUR 50,000 is likely to be deposited in a bank account where it will wait for Sentsov, or, if necessary, it will be handed to his children. "It would be ideally if Oleh himself receives this award and disposes this money himself," she added. The awarding ceremony of the Sakharov Prize takes place on December 12. Earlier, Kaplan said that the Sakharov Prize was an additional step towards the release of Sentsov. As reported, Ukrainian film director Oleh Sentsov was awarded the Andrei Sakharov prize "For Freedom of Thought" by the European Parliament. Sentsov was nominated for the preliminary list of candidates by the largest political faction of the European Parliament - the European People's Party (EPP). Since 1988, Parliament has awarded the Sakharov Prize to individuals and organizations that defend human rights and fundamental freedoms. The 2017 Sakharov Prize was awarded to the Democratic Opposition in Venezuela. 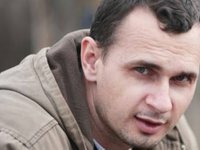 Sentsov has become the first Ukrainian in the history who received this award. On October 23, Sentsov also won the Pro Dignitate Humana Prize, awarded by Poland's Minister of Foreign Affairs.